With less than a third of the list left to reveal, things are really starting to hot up. And just like that, we’re already down to number 40. It seems like yesterday we were talking about Real Betis and their home kit up in 96th place, but now we’re already getting to the point where the great is starting to separate itself from the good. I like arguments/friendly discussions on Twitter, so if you’ve got an opinion about any of the shirts in the this next 10 or indeed the rest of the list, you know what to do. UNAM have one of the most iconic shirts in world football. For 2018, the puma crest incorporates the badge of the National Autonomous University of Mexico, the university that the team represents. This creates a stunning centerpiece. Yet one problem of Mexican club shirts is the abundance of sponsor’s logos, but thankfully this shirt looks amazing even with the sponsors. The logos have been applied in a single colour and most importantly, they don’t distract from the overall look of the shirt. It just would not be a top 100 list of shirts without mentioning UNAM and their famous Puma-fronted kits. Everybody has used a version of this kit throughout recent Ultimate Team years and with good reason. 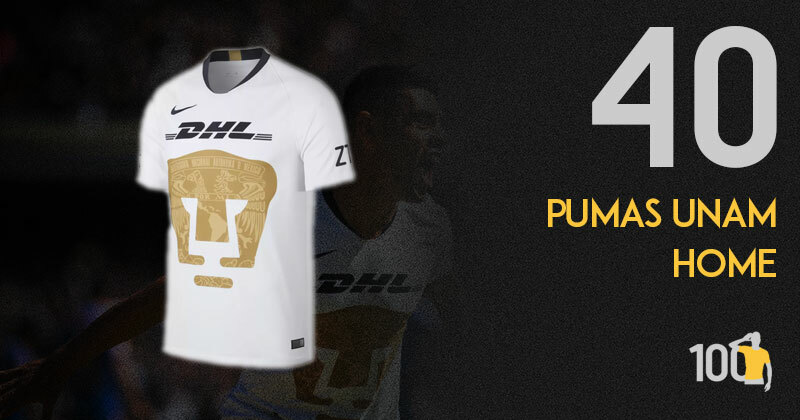 This year's take is white with a classy golden Puma emblazoned on the front, whilst featured within the Puma is a logo of the National Autonomous University of Mexico - the university from which the club originates. Umbro have really outdone themselves with this shirt, I almost don’t know where to begin. The darker green primary colour looks great, especially when working with the turquoise secondary colour found on the rest of the shirt. The pattern running across the front looks just subtle enough not to look too busy, and the Umbro logo around the sleeves is a tasty and interesting way to work the manufacturer logo on (much better in my opinion than the way the Kappa logo is used). To me, Umbro were THE kit manufacturer of choice in the early 1990s and this shirt really reminds me of that era. On the front, there is a big logo reminiscent of what Umbro did with shirts back in 1994. 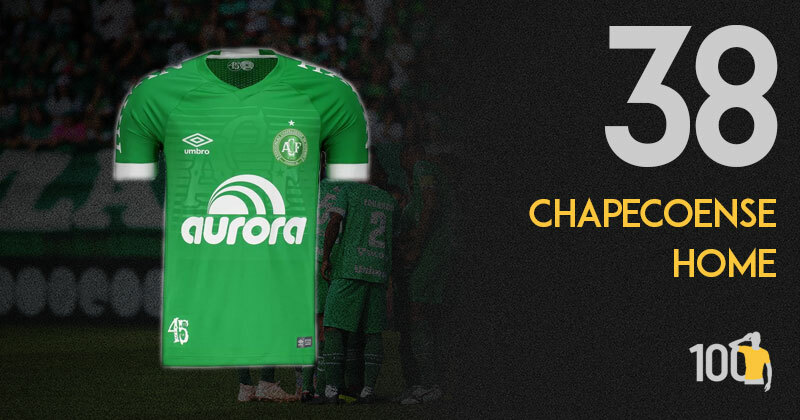 In addition to this, the white edge to the sleeves include the word ‘Chape’ written in the shape of the Umbro diamond, similar to Umbro training wear in the 90s. The rest of the shirt is a great combination of green and white with a sleek cut. However, it’s the nods to Umbro’s past that really made me fall in love with this shirt. One of my favourite kit drops of 2018. Aston Villa partnered with local UK brand Luke 1977 for this. Exciting to see Aston Villa look around home for help. 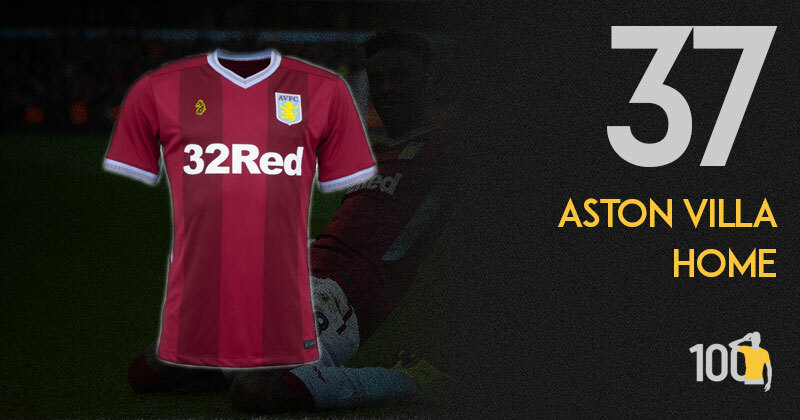 This kit puts the fans first and recognises the years of history that Aston Villa has. A simple old-school stripe and the back of the neck graphic that’s a symbol of McGregor’s famous statue outside Villa Park. Keen to see more collabs in 2019. A lovely kit made in house, which proves the kit manufacturing big-hitters don’t have a monopoly on style. The two-tone claret and sky blue v-neck collar are a quality tribute to kits of Villa’s all conquering past, when they won a title and beat Europe’s best. The sky blue panels below the sleeves cap a brilliant retro-inspired shirt which is something Villa fans can be proud of. If black is the colour this season, this is the shirt of the season. Not only is this as pure as it gets in terms of a design, AIK also wore black way back in 1901, winning the league title. 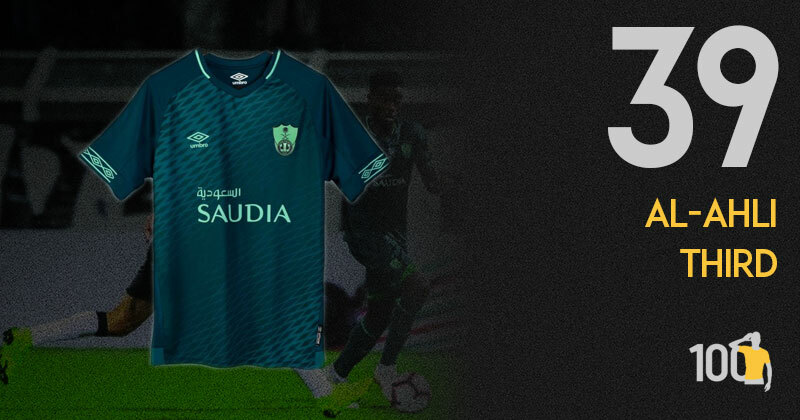 To be honest even without this link I would adore this shirt, but the fact it also has ties to an historical kit of the club makes this one of the truly great shirts of 2018. In recent years, there has been a trend for some teams to release ‘black-out’ versions of their kits… here, Nike and AIK show everyone how it should be done. 127 years ago, AIK wore their all-black strip for the first time and this shirt was released to celebrate that occasion. 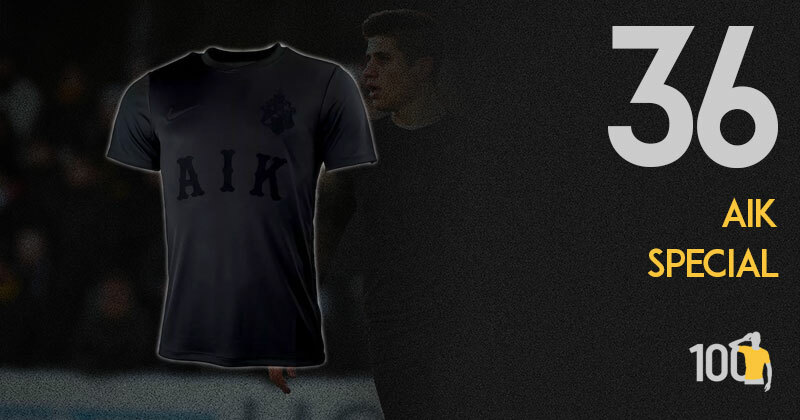 Other than the colour, the only other nod to the club’s past is the ‘AIK’ written on the front, in a retro font. This shirt sold out in an instant and it’s not hard to understand why. Beautiful. At first glance, it seems as if Adidas once again raided their archives to get some inspiration. It certainly reminds me of classic Adidas designs of the 1980s. However, like most shirts nowadays, there is an explanation to the thinking behind the design. 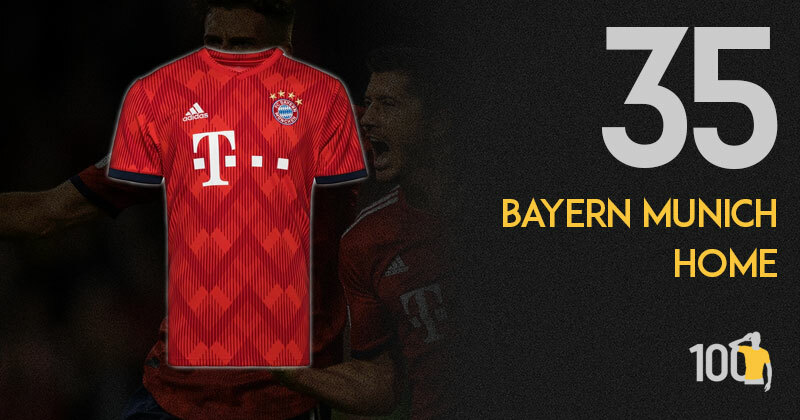 The diamond pattern that covers the shirt is a nod to the diamonds found in the centre of the Bayern Munich badge and these diamonds have been arranged in an ‘M’ shape as a tribute to the club slogan, ‘Mia san mia’ (roughly translated as ‘We are who we are’). The J-League have had some absolutely mental kits over the years and Shimizu S-Pulse is no stranger to both cult classics and clangers. They generally favour the bright orange vibes and the detail is usually some form of map, whether it be of the world or a local area. Super strange. somehow cool. Very Japanese. I love it. 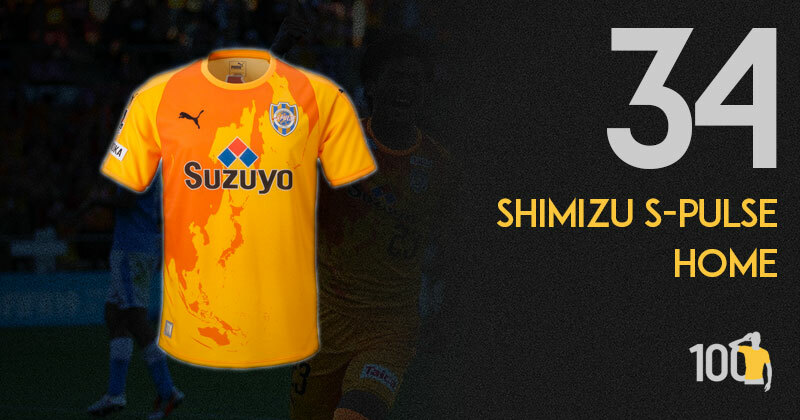 Shimizu S-Pulse have a history of using some fantastically, extravagant shirts and this year seems to continue this tradition. On the front of the shirt, there is a map of Asia with Japan in the middle of the shirt, taking centre stage. On the back of the shirt, mount Fuji is depicted, to commemorate the 5th anniversary of it officially becoming a World Heritage site. The vibrant and varied use of orange add to the overall striking effect of the shirt. Just another stunner to add to the J-League collection. This year’s beaten finalists in the MLS Cup have actually been rocking this kit for two years now. And when the shirt is this nice, why wouldn’t they? For me, this shirt is all about the colour combination. The green and gold work really well together. It creates a smart, understated look. The addition of the buttoned, grandad collar reminiscent of those found on some 1990s Adidas kits is also very nice. 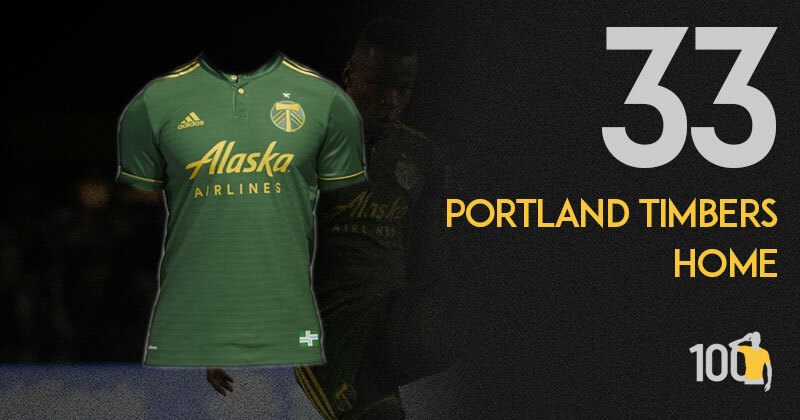 I’m not somebody who watches the MLS, so when I saw this kit I was shocked. That hearty green colour works perfectly with the soft gold, and it just gives you that relaxing, rustic feeling that perfectly suits a club with the name containing “Timbers”. The classic Adidas stripes down the shoulders really works with the gold too, and the thin line around the sleeves looks perfectly in place. 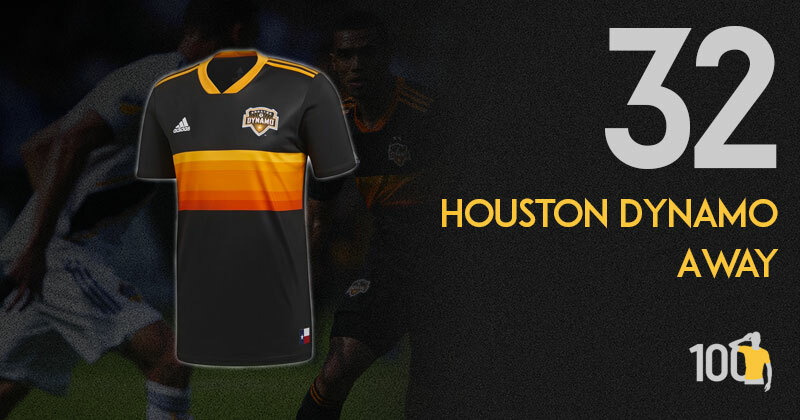 This Houston Dynamos away shirt is one of my favourite shirts this year and I’m gutted it’s not higher up on this list. I think this is a great example of a shirt using the club colours to great effect. The black contrasts superbly with the vibrant, orange stripes (a nod to the Houston Astros baseball team) across the front. The gradient effect is one many are using this year and this effort from the Dynamos is a fantastic example of how to be part of the trend while still being unique. I’m glad MLS features so highly on this list. adidas haven’t had the best of years outside of their World Cup kits, but over in the U.S. we’ve seen signs of life from the three stripes. This is my personal favourite from the league, with a design taking inspiration from a old Houston Astros (baseball) team jersey. The sunset gradient central bands are a joy to behold, though there would be a big improvement if the design carried round the sides and back. There is a certain charm to Mexican shirts with their exaggerated amount of sponsors. Bonus points if you can squeeze the club name across the chest. This design is of course the same base as that of Orlando Pirates (68th on Top 100 Shirts). Is this particular shirt that much better? Probably not, but the higher profile of the Mexican league and that extra dose of charm help give this shirt plenty of ammunition. A spot inside the top 3rd is testament to that. Now this is a banger. Standing out for all the right reasons, the Tigres Home Kit is a piece of art. One that’ll be remembered as a cult classic amongst like 100, the yellow and orange stripes matched with the hyper blue detailing is amazing. Even all of the sponsors look at home with the kit. 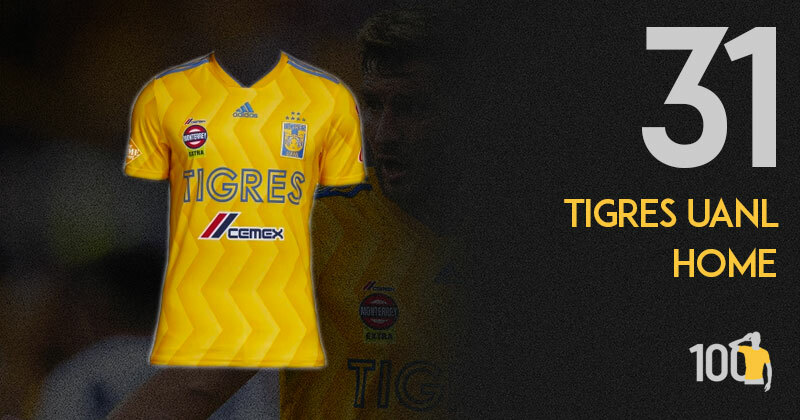 With the unfilled TIGRES on the front, it really is one of their best efforts to date. Hats off. Thanks for sticking with us up to this point. We're just days away from revealing the best shirts of the year, and we hope you enjoy the final few shirts as much as we do! Haven’t you always wondered what the 63rd best shirt of 2018 was? Now you can find out. As the second half of Top 100 Shirts begins, we see a focus on Nike’s superb third kits this year. 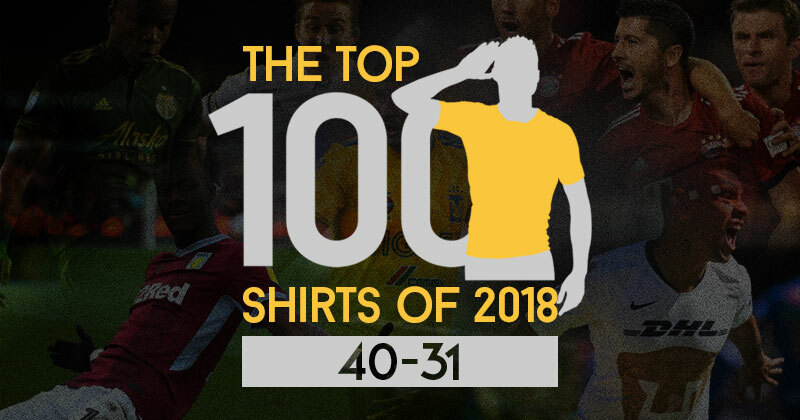 Top 100 Shirts rolls on, with the Bundesliga bringing 3 shirts to the next portion of our countdown.